Uncapped goalkeeper Connor Roberts is in the Wales squad to face Netherlands in Amsterdam on 4 June, but Arsenal midfielder Aaron Ramsey is rested. Ex-Cheltenham keeper Roberts, 21, has been called up by manager Chris Coleman after Boaz Myhill's retirement from international football. Uncapped defenders Paul Dummett and James Chester come in for injured pair Ashley Williams and Ben Davies. Real Madrid's Gareth Bale is as expected included in the 23-man squad. Swansea defenders Davies and Williams - the Wales captain - both played the latter stages of the Premier League season with toe fractures. 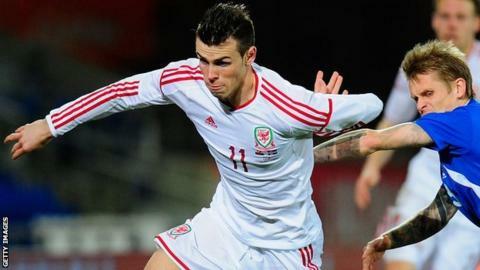 Uncapped Manchester United midfielder Tom Lawrence, 20, is also drafted into the senior Wales squad for the first time. Newcastle's Dummett, 22, is a former Wales Under-21 player. Hull's Chester, 25, is a recent addition to Coleman's options and overcame hamstring trouble to play in their 3-2 FA Cup final defeat by Arsenal. But Hull boss Steve Bruce had said that even if Chester were to play at Wembley, he would not be available for Wales' trip to Amsterdam. Ramsey, who scored his side's winning goal in the FA Cup final win over Hull, has been rested for Wales' seventh meeting against the Dutch. He was sidelined for four months with a thigh injury before returning for the final weeks of the season and Coleman felt it was better not to gamble on the player's fitness. "We don't want to take the chance and it's not fair on Arsenal and Aaron," he said. "If this was a qualifier, maybe we could have pushed it a bit more. "But in all fairness we think it will benefit him, us and Arsenal and he'll be ready for the start of the season fingers crossed and for the September game, which is huge for us." Netherlands are in Group B at this summer's World Cup in Brazil, alongside Spain, Chile and Australia. Wayne Hennessey (Crystal Palace), Connor Roberts (unattached), Owain Fon Williams (Tranmere Rovers), James Chester (Hull City), Paul Dummett (Newcastle United), Danny Gabbidon (Crystal Palace), Declan John (Cardiff City), Lewin Nyatanga (Barnsley), Ashley Richards (Swansea City), Neil Taylor (Swansea City), Joe Allen (Liverpool), Jack Collison (West Ham United), Emyr Huws (Manchester City), Owain Tudur Jones (Hibernian), Andy King (Leicester City), Tom Lawrence (Manchester United), Joe Ledley (Crystal Palace), David Vaughan (Sunderland), Jonathan Williams (Crystal Palace), Gareth Bale (Real Madrid), Simon Church (Charlton Athletic), Jermaine Easter (Millwall), Hal Robson-Kanu (Reading).